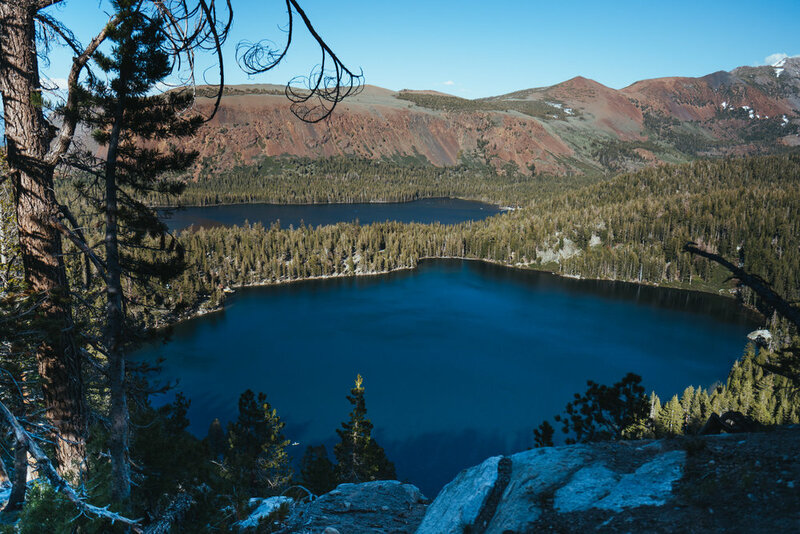 Crystal Lake is one of the most popular lake hikes in Mammoth - and for good reason! It's easily accessible, a short but strenuous hike, and the lake is surrounded with beautiful looking snowy peaks. The original plan was to visit Crystal Lake for sunset, but we decided to head up a little bit earlier instead. That late in the day, we were one of 3-4 groups on the trail! The trail starts off pretty quickly and immediately climbs up through some steep switchbacks. About 0.5 mile in, we started seeing snow on the ground that covered up some of the trail. It was relatively easy to find the trail though because of all the footprints. When you hit the top of the switchbacks, this is when the trail could get a little bit tricky. There are some offshoots to a look out, but isn't the lake! You'll need to continue on (to your right) and go down some small rocks before you hit the lake. Once you're at the lake, the trails are even less defined. We explored around a bit, did some swimming, then traced our way back to the switchbacks. On the way back, I ran into a father + daughter couple that took a wrong turn (and I followed them). 10 minutes in, I realized we absolutely were not going the right way and tried to chase them down to turn around. Unfortunately they had climbed down really far down following the wash of Cedar Creek. I turned back around and found the junction that we missed (it's pretty easy to miss). To be safe if you are hiking alone or in a small group, I would make a small cairn to mark your routes after the switchbacks so you have a good turnaround point.